Old wines are always something of a mystery. 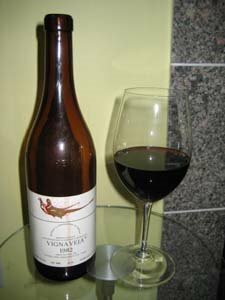 Case in point, the bottle of 1982 Vignaveja we’re about to uncork. What is going to happen when I open this vintage? Will it be dead, oxidized, or will it be a wonderful old bottle full of life still? This particular bottle is actually Susan’s – a semi bribe and pay back for some editing she did for me at very last minute. The “fee” was two older bottles of wine from my cellar preferable at least one of them a Gaja that she’s always wanted to try. However, she very graciously decided to share this bottle with me. Wonderful woman. There where problems from the start. A very long cork that really didn’t want to allow itself to be removed from the bottle where it had rested for quite sometime – almost 27 years to be exact. With a lot of work, we finally managed to remove the cork although in many pieces – many, many very small pieces. As we decanted the wine – surprisingly there was just a little sediment in the bottom of the bottle – a wonderful smell of fruit and leather filled the room. The color was a deep dark red, also very surprising. But would it hold up? Sometimes with older wines, I’ve had them die as soon as soon as they get hit with air. The colour, too, was amazing for its age – a deep red with a brick red rim and no hints of orange or brown at all. How long would the color last? Mentally, I was trying to do a WSET tasting note – impossible. Each sip, every glass changed by the minute. The first glass started out as dried roses, dark cherry, and vanilla. Half way through, a little bit of smoky notes made an appearance. The second glass became all about leather and tar, truffles and forest floor. There where still some tannins, but with the corners rounded off, then pure silk. The acidity was present all the way through. Very long finish, quite amazingly long, in fact. The third and final glass started out all truffles, mushrooms, saddle leather, and earth. Then suddenly, with an ounce or so left in the glass, it died and became all sherry notes and acid. Still, there’s no question this was an amazing wine – Nebbiolo (seen left) again showing remarkably well for its age. Apparently it originally sold for less than $30 although I could find very little about this vintage on the web. Wine Spectator rated the 1983 at 94 points. If any one has any information on this wine, we’d love to hear about it. Okay, sure I’ll often do Frank’s editing for free but this one was a bit “extreme” – half an hour to take care of some promotional material that should have been at least a four hour job – so I figured it was the perfect opportunity to snag the Gaja I’ve had my eye on for over a year. Success at last. This entry was posted in 1982 Vignaveja, Gaja, Italian Wine, Nebbiolo, Tasting Notes, WSET and tagged Barolo, Bottle, Champagne, Gaja, Glass, Nebbiolo, Wine, Wine tasting. Bookmark the permalink.